Who would have thought? 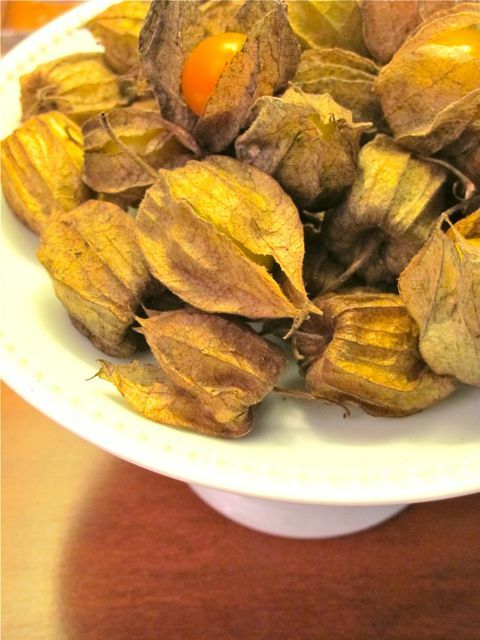 Finding cape gooseberries at the Centris market was a real surprise. I only ever get to Centris once or twice a year as it is at the other end of town (not such a bad drive early on a Sunday morning actually) but I really should go more often. Not only did the Benguet State University? stall have these beauties, they had organic strawberries (a big deal to get strawberries that haven’t been sprayed), nice cherry and mini-tomatoes, and other goodies. I have always been fascinated with these berries when I’ve seen them used as a garnish abroad. They sit on top of cakes, sometimes coated in sugar, and almost always with their “husk” or “capes” twisted behind them. Native to South America and now often grown in South Africa, Australia and New Zealand, they are a relative of the tomato and have a sweetish tart taste. I ate a couple at the stall before purchasing 300 grams worth for PHP90 total. If you’re curious, here’s more on this fruit. I see them sold as ‘chinese lanterns’ in small punnets at the grocery. They always decorate tops of cakes in chi-chi pastry shops with 1-2 of these gooseberries with some chocolate sculpture beside it. I personally do not like its taste. It is pretty though. I think it is similar or the same to what we called in Ilonggo, “tino-tino” which grows everywhere in rural areas of Silay. We used to popped it more than we ate it. Did not know it is used as cake topping. How neat! MM, how does the size of these gooseberries compare to something more familiar (say, a calamansi)? The pods look familiar though I’m not sure if those you featured here are the same thing as the ones I have in mind. Thanks. These look identical to a Physalis species I’ve grown several times under the name “pineapple tomatillo”, which is much smaller than a normal green or purple tomatillo (those are often up to 2 inches across) and distinctly pineapple-flavoured. 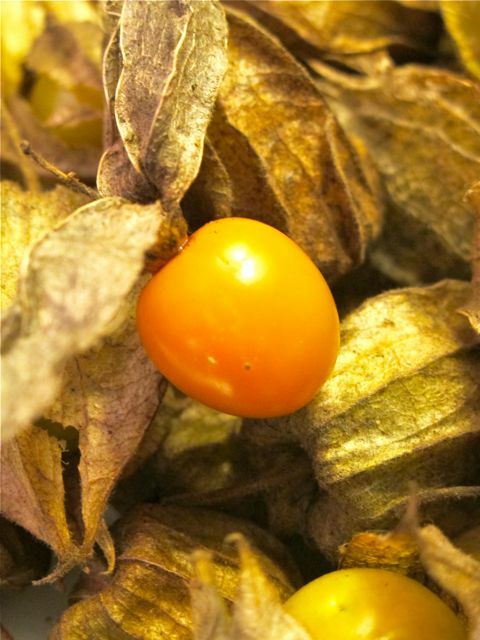 Some in the northwestern US and midwest call it a groundcherry. Excellent used raw in salsa, especially for fish, mixed with something more acidic (green or purple tomatillos or an acidic tomato) and chiles to offset the sweetness. They grow like weeds in most places, so watch out for dropped fruit! these are called “tino-tino” in Negros. They grow wild. Are these a relative of the gooseberries I see Hugh Fearnly-Whittingstall cook in his tv shows? Actually, ohinuj, I don’t think cape gooseberries are related to other gooseberry fruits… these are more closely related to tomatoes, and by family to eggplants I think… lee, they might be similar or the same fruit, but care must be taken as some varieties are poisonous, I gather… Kate, thanks for that link! interesting! how do they	taste, MM? did i tell you we had some wonderful tomatillo jam from a roadside stall on the way up to sagada? apparently, they’re grown there, too. oh, wait…aren’t tomatillos and gooseberries related? these grow wild in the mountains of the cordillera. its called “dulsi” in sagada where every now and then you can find them being sold at the saturday markets by young boys who foraged for them. Had them at a house dinner in England — stewed in a sweet syrup then served with that rich, yellow cream that seems to be available only in England and Europe. Never see gooseberries served as dessert in U.S., except glazed as part of a petit fours dessert tray at a few high-end French restaurants. I see them in Boston’s farmers market but only for a couple of wks. Love them! These do belong to the physalis fruit genus, an mentioned by Kurzhaar. First encountered them in Europe or Hong Kong well over 20 years ago as decor for various dishes, usually in autumn. I was surprised recently when a friend who grew up near Tuguegarao told me that they are abundant in their home village. If it’s that easy to raise, it’s the kind of thing that we can grow and export to nearby markets such as HK, Taiwan and Singapore… The same way we export asparagus and other high-value agricultural goods. These (or something related to it) grew on a vacant lot we played in when we were kids. This was in Las Pinas and some of the kids actually munched on it when they saw a ripe one. I tried it out and it sort of tasted like very ripe tomatoes. Still life pictures of gooseberries..Your photos are stunning!! They were brought over the Philippine shores from Central America via the Galleon Trade, and have since gone ‘wild.’ Just like guava, papaya, guyabano, pineapple, aratiles, chile, cacao, tisa/chesa, to name a few. I used to see this fruit in Leyte when we were kids by the rice fields but we don’t eat them because we were taught that the fruit is not edible. So we just play with them, opening the “leaves” to look for ripe ones for “lutu-lutuan”. I saw the same thing and bought some in Mercate a couple of months back. When I took them home, my mom laughed at me and said they used to have this before in their house in Tarlac and they were ignored generally. But since it’s new for me, natuwa naman ako. I’m with kurzhaar, these look like a Tomatillo variety, I have tried growing these in tagaytay. They grow and produce some fruits, but not very much nor for an extended period of time, so have not tried them in larger quantities. 2 varieties of cape gooseberries…one as mentioned by Kurzhhar is the pineapple cape gooseberry…about the same size as Red Globe grape more tart in flavour. 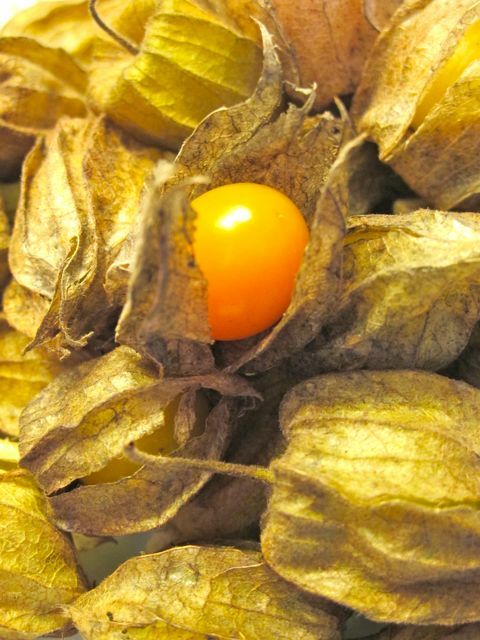 The other one which is my favorite is Aunt Molly’s cape gooseberry…much, much sweeter than the pineapple one but much smaller …like a green grape. they are ripe when they fall to the ground. it is an invasive plant. Do plant only 1 for it is sprawling. I plant can you give more than enough fruits you can handle. they just keep on producing fruits till the frost sets in. You can put the ripe fruits in a jar, make a spiced white wine, pour over the fruits and let it cure for several months like RUMTOPF….makes excellent Christmas presents for your foodie friends. Thanks for this info. In Quebec, they are called “cerises (cherries)de terre” and is easily found in the markets and in gourmet cuisine nowadays. I use them in salad to add colour and taste. They are really good. These plants are familiar to me when I was growing up in the Phils. My friends and I would pick the unopened young buds and popped them on our foreheads! It was fun then to hear the loudest noise. We never bothered to eat the ripened fruit since we were told they could be poisonous; that scared us. No wonder I thought tomatillos looked like giant gooseberries; they are related! thanks again MM. This is enligtening. but there’s another wild fruit that you haven’t featured here, MM, and i’m sure many will identify it as one of their childhood pleasure, like aratiles (called mansanitas by many). i don’t know what it’s called, but it grows in a vine, is yellow when ripe, and the fruit is encased in a thin “hairy” outer shell, much like a green net. a thin pulp clings to the black seeds inside the fruit, and it tastes somewhat like meon. does anybody know what it’s called? acive, I have several posts on Benguet and Baguio markets in the archives. Just hunt backwards or google them… I have been to the wholesale markets in Benguet, some farms, the Baguio markets, etc. Millet…you are referring to what is known as BUSH PASSIONFRUIT…passiflora foetida…is it right, Kurzhaar? From your description, it is a milder PASSIONFRUIT in taste…has sweet tangy pulp that encases the seeds, bears fruit several times a year making it really very productive and maybe worth planting! it requires full sun, you won’t find it deep into the forest. But be warned that the unripe green fruit is not edible by any means!!! Since it is a vine, makes excellent ground cover…serves dual purpose…ground cover and pag kain pa! bettyq, you’re right, that’s the fruit i was referring to– bush passionfruit indeed! Thank you! I knew you’d know what i was talking about. I haven’t seen them in about twenty years, i think. those are called tino-tino in Capiz, they grow in ricefields and a wet summer will make them bland while a very dry one can the make it quite acidic even when ripe. “Si-o Si-o” “tino-tino” are abundant in our rice field… Craving taste way back my younger age… you gave me idea mr MM for $$$$$$…. Elaisa, no, I don’t sell them. I just wrote about them.